FO: Green Mountain Madness Socks | carpe diem! I’ve forgiven him the photo of a yarn shop window; he brought back a tin of maple syrup (we were running low), a dinky little bright green ipod shuffle (the cord on my old one is absolutely disgustingly sweat-stained), and 2 skeins of qiviut. And a lot of washing. These socks are perfect in circumference, but still slightly too long. I may just knit a toe or two to see how difficult it would be to open the toe, shortening it by ripping back about 1.5cm, then grafting it closed. The airport was an ideal opportunity to knit. 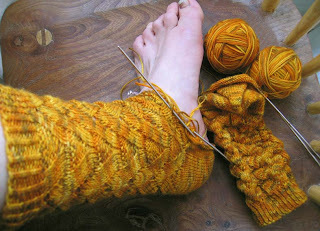 Lots of progress on the Amber socks. 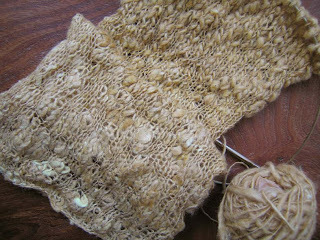 The heel is turned using K2tog/SSK instead of wrapped short rows. It seems to be a simpler method, worth remembering. I’m following the instructions as written, which resulted in a tiny pointed heel (visible on the sock I’m not wearing) but that won’t show when they’re worn. I’m working as fast as I can on these, as there are so many other things I want to knit — including the seriously interesting BMFA Rockin’ Sock Club ‘Monsoon’ socks. I’ve seen a lot of pictures and it’s really, really hard not to just cast on. 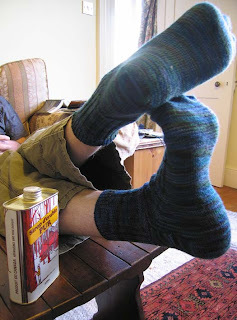 But the rule seems to be only one pair of socks per person on the needles at any one time. I suspect the Tuesday spinners/knitters have accurately diagnosed my addiction: Lynn started calling me ‘Professor Sock’ last week when yet another person asked for advice on sock-knitting! I also want to try a rib-warmer; I think it won’t entirely suit me (too square), but I like the idea. Anyway. I don’t really mind the long drive to and from the airport (Gatwick this time). His car is comfortable, has decent speakers, and I allow lots of time for the journey; there are always queues and delays. At least this time I had time to admire the view from the top of the bridge at the Dartford crossing. Airports are strange places. Like railway stations and, to a lesser extent, Tube (Underground) stations, they’re what’s the word, I can’t think of it marginal? Liminal. That’s the one. Places defined by their existence between other places. I like the feel of transience, unreality, liminality. Spending an hour (I was early and the flight was late) knitting socks in the coffeeshop by Arrivals, I was a stationary object, a landmark in the constant flux, the flow of people arriving, greeting and being greeted, and departing again. I moved to the edge of the Arrivals area for the next hour (the monitors were broken so I didn’t know when they’d clear Customs) and began knitting the travelling scarf that lives in my bag for times like these, when I have to knit without thought. This entry was posted in Uncategorized on April 7, 2007 by sarahw. That silk may feel odd, but it sure is producing an interesting visual texture.And your socks? I covet them. That is all. I too love the gold socks. As for knitting while travelling, or waiting–it’s like found time, I agree with you. I love it! Sometimes I am sorry I’m not travelling more, because I think, gee, if I just had a little time on a train, car or airplane, this X would be finished!